The study followed 32 freshman college football players from two National Collegiate Athletic Association Division I programs across one competitive season and compared them with 32 healthy college undergraduates, who were selected to roughly match their counterparts in age and race. Researchers at the Emory University School of Medicine have found that after completing one full season of college football, players demonstrate relatively stiffer arteries compared to other non-athletic college students. Findings were published in the Jan. 15 edition of the American Journal of Cardiology. Arterial stiffness, or the loss of elastic properties in the arteries, occurs before the development of high blood pressure, a serious risk factor for stroke and heart disease later in life. In addition, arterial stiffness is itself an independent cardiovascular risk factor. 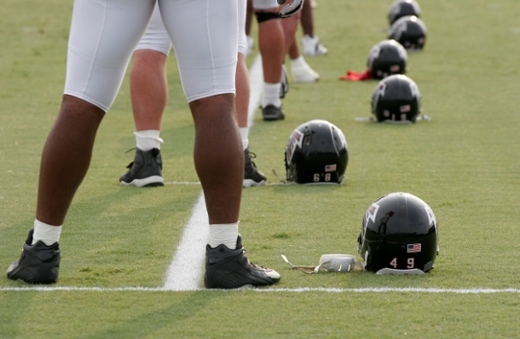 The study followed 32 freshman college football players from two National Collegiate Athletic Association Division I programs across one competitive season and compared them with 32 healthy college undergraduates, who were selected to roughly match their counterparts in age and race. This research is part of a longer ongoing study of cardiovascular health among college football players. "Our study builds on previous research that has shown a high prevalence of high blood pressure in both professional and collegiate football players. Our data suggest football exposure at the collegiate level is associated with early, sub-clinical vascular dysfunction," says lead author Jonathan Kim, MD, assistant professor of medicine (cardiology), Emory University School of Medicine. "Although our current findings require replication, we believe our results provide a compelling argument for the need of improved preventive cardiology measures, such as repeated blood pressure measurements and clinical follow-up throughout the season in higher-risk football players," he adds. Kim emphasizes the need for more research in larger cohorts of football players (including high school players) to confirm these findings and learn more about the causes and exact timeline for these changes. "Future study will help us learn more about the causes of these observed changes - possibly diet, undiagnosed sleep apnea, use of non-steroidal anti-inflammatories, and intense isometric physiology are all potential mechanisms," he says. "We also need to know more about the time course for these changes beginning with high school football, continuing throughout a collegiate and possible professional career, and finally at the end of a football playing career." Researchers have previously proposed that the intense stop-and-start nature of football as well as the physical demands of competitive participation, such as rapid weight gain, could play roles in making football distinctive in its effects on cardiovascular health. Kim launched a cardiology clinic at Emory Saint Joseph's Hospital in July 2014, evaluating and treating cardiovascular conditions specific to athletes of all ages and levels. He is the first sports cardiologist within the Emory Healthcare system and the only specialist in Atlanta to establish this new type of practice.